Barbour, M., Kinsella, J., Wicks, M. & Toker, S. (2009). Continuing Change in a Virtual World: Training and Recruiting Instructors. 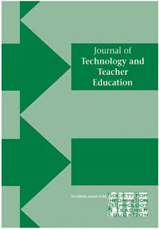 Journal of Technology and Teacher Education, 17 (4), 437-457. Waynesville, NC USA: Society for Information Technology & Teacher Education. Retrieved April 23, 2019 from https://www.learntechlib.org/primary/p/28210/.